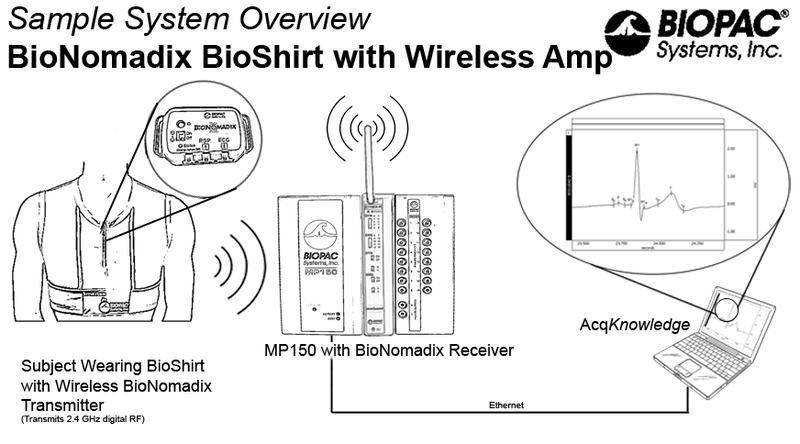 The lightweight, comfortable BioNomadix BioShirt contains a respiration sensor and fabric electrodes to wirelessly record both respiration and ECG while ambulatory subjects move freely and perform tasks in short or long-term studies, in the lab, or in the real world. 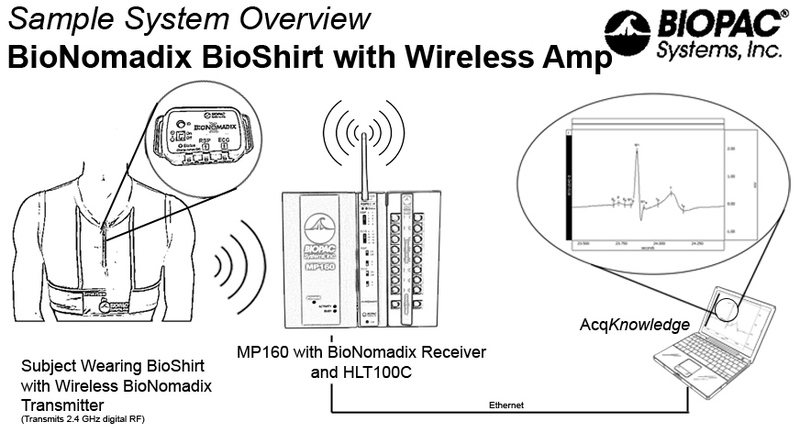 The shirt connects to a BioNomadix wireless Respiration & ECG Transmitter (BN-RSPEC) that is placed in a small pocket on the front of the BioShirt—no electrodes, gels, or wires to fuss over. 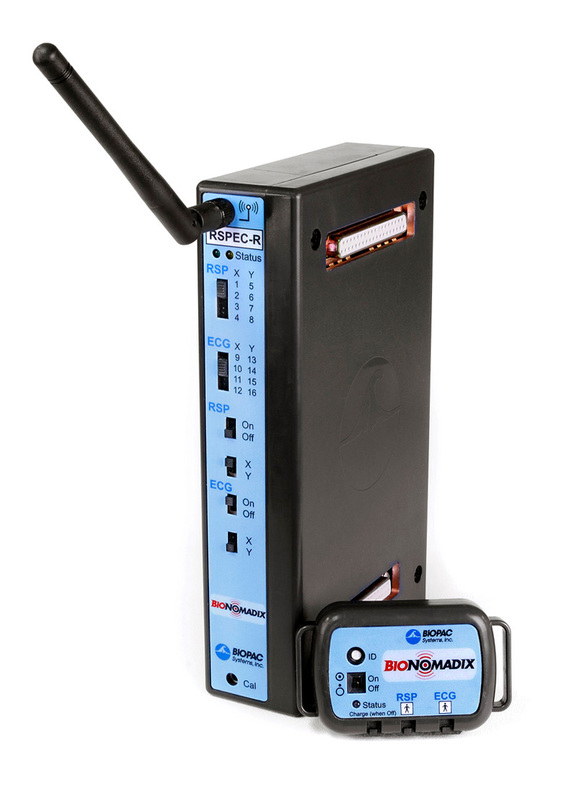 Transmit data to a BioNomadix Smart Center, Logger or matched Receiver+MP160/MP150 System. 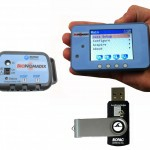 BioNomadix wireless recording and AcqKnowledge software provide a powerful, complete, wireless solution that supports advanced analysis for applications and measurements for a variety of physiological parameters, including: Heart rate, respiration rate, Heart rate variability (HRV), Respiratory Sinus Arrhythmia (RSA), etc. Combine with the Logger, GPS tracker, Eye Tracking glasses, and other wireless sensing devices for comprehensive analysis of your subject’s experience. 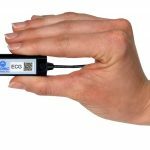 The Logger’s accelerometer can provide activity information, the GPS will provide a history of a subject’s movements, Eye Tracking glasses provide Gaze/Event overlay on Video, etc. 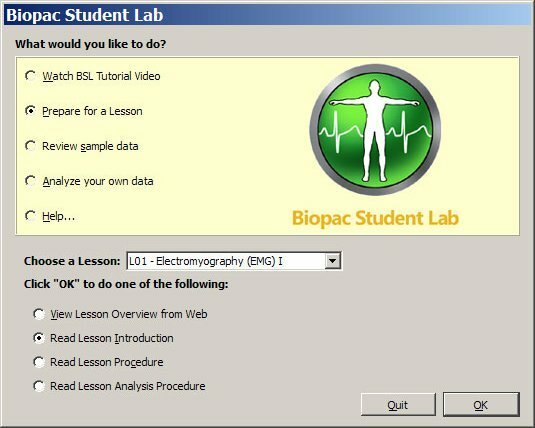 Get the real-life data your study demands! Sized separately for men (76-124 cm) and women (65-97 cm), for a snug fit below the bust to maintain sensor contact. Unobstrusive transmitter placement significantly improves the quality of the data, and makes it much easier for subjects to respond naturally. 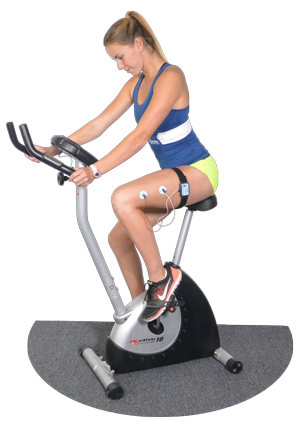 The shirt allows the subject to wear the devices in natural and well balanced positions for long-term physiological studies exercise regimes. 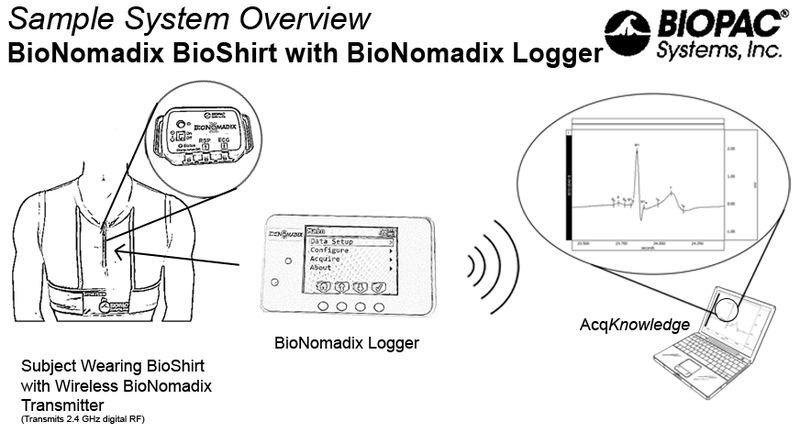 The BioNomadix BioShirt provides a greater degree of comfort and mounting flexibility for dual-sensor studies. Easy setup, targeted sensors, and unhindered transmission significantly improve the quality of the data and make it much easier for subjects to respond naturally. 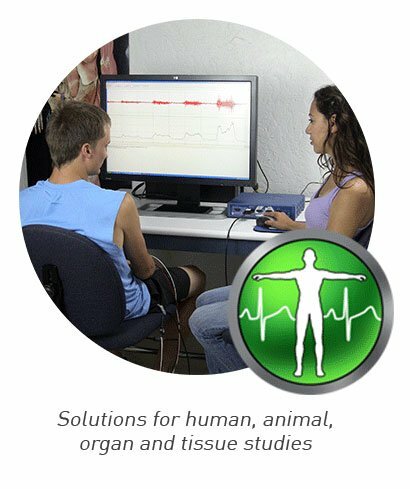 Whether your protocol runs in the lab, in the field, or overnight, the BioShirt makes it easy to manage multiple setups, record subjects on the go or at home, and maintain subject comfort while recording great data. 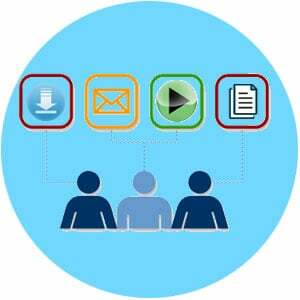 AcqKnowledge software displays, controls, analyzes, replays, and exports BioNomadix data in one convenient program. 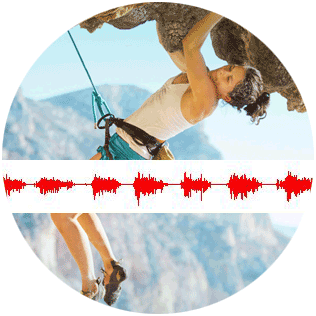 Plus, the Logger allows subjects to record personal synchronized audio notes and mark events of interest. 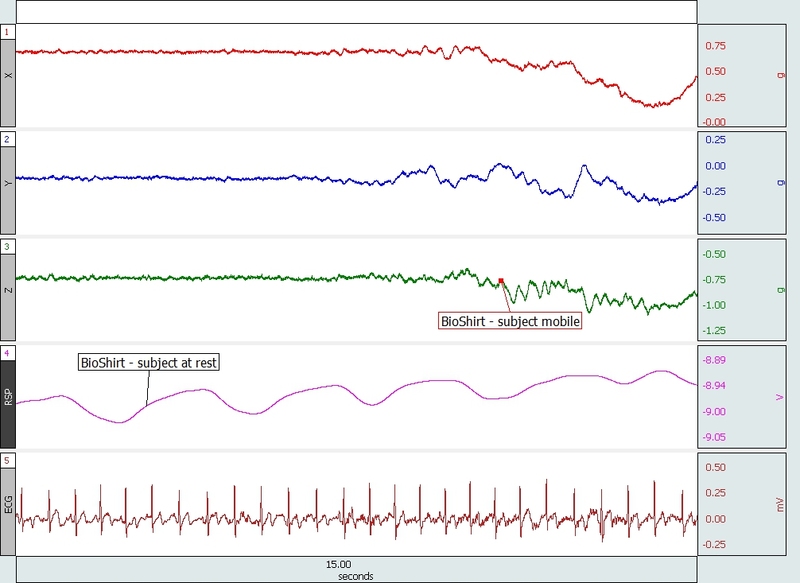 Wireless recording offers unparalleled ease of use for both researcher and subject, in a lab, home, or real-world setting. 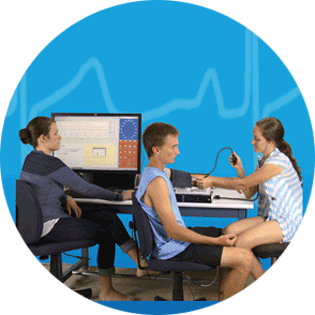 BioShirts provide a high level of comfort and are ideal for long-term monitoring of physiological parameters. 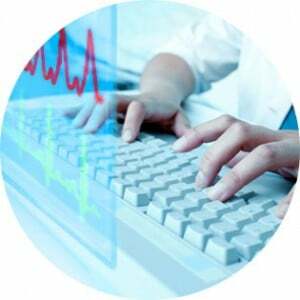 The ECG and respiratory signal are obtained by means of sensors made of yarns that are fully integrated into the shirt’s textile structure. The sensors are made of fibers that are directly woven during the production process, and connections between sensors are obtained using conductive fibers for a totally unobtrusive, highly comfortable sensorized garment. The base yarn is composed of anallergic and antibacterial materials to guarantee a safe and prolonged use. Machine washable with mild detergent—do NOT use fabric softener. 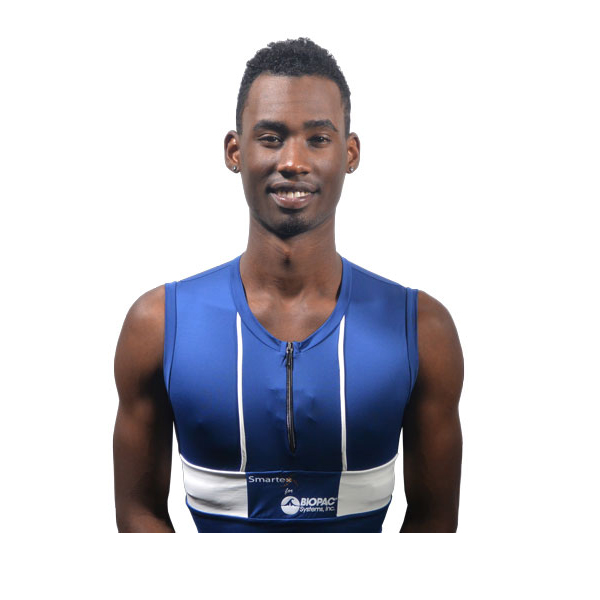 For optimum sensor placement and performance, select BioShirt size based on under bust measurement; fit and cut are distinct for men and women. 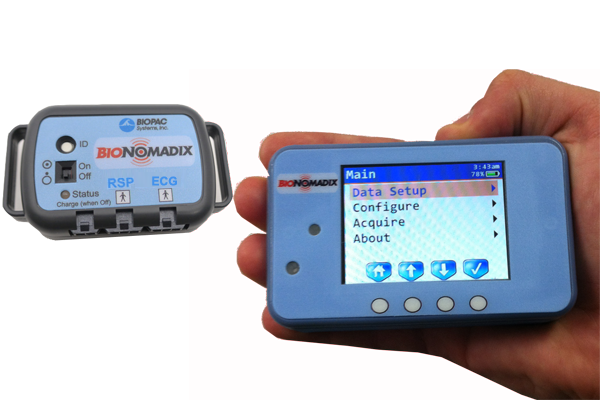 BioNomadix Transmitters noninvasively record full-bandwidth physiology data and the dual-channel transmitter devices records Respiration and ECG. 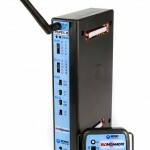 BioNomadix Transmitters are used with the BioNomadix Logger or a matched BioNomadix Transmitter-Receiver set (Transmitters are included with some BioNomadix and Logger Systems). 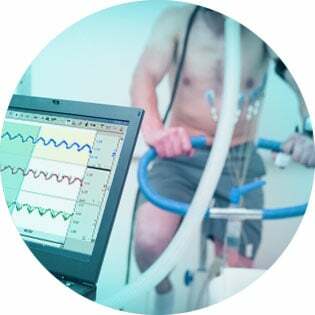 The BioNomadix system of wearable wireless devices delivers the freedom to discover the data the researcher desires, in the environment and at the scale of the researcher’s choosing, with the quality scientific research demands…request a demo today!